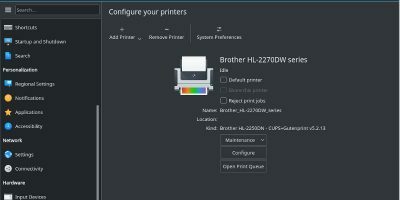 As with most tasks in Linux, there are multiple ways to handle removable devices, but for removable media in particular, KDE’s primary tool is the Plasma Device Notifier Widget. It is activated by default on the KDE panel in all 4.x versions of the desktop environment. From it, you can manage all sorts of removable media, including hard drives, SD cards, USB flash drives, CDs, DVDs, cameras, and music players. 3. Check “Device Notifier” and click “OK”. For most removable media, you will only want it to connect on a per-use basis. Once a device is inserted or attached, the Device Notifier will popup over the system tray icon, showing you the device. If you do nothing, it will slip away after a few seconds. At any time, you can click on the icon to see the devices again. 3. The number of available actions you can perform with the device. To the right of the device information, you will see an icon that looks like a plug or connector. Clicking it will immediately mount it but will not perform any further actions. This is useful if you want it mounted but do not necessarily want to access it at the moment. Click anywhere else on the device to bring up the actions menu. Some example actions are: “Download photos with…”, “Open with File Manager”, “Play Audio CD with Amarok”, and “Copy with K3b”. Once you are finished using your removable device, you need to unmount it before removing it. First make sure you are not accessing it with any applications. 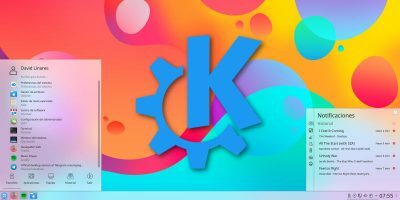 Although KDE applications will communicate with each other and automatically detect an unmount, others may keep the device busy and prevent you from unmounting it. To proceed, click the up-arrow icon that looks like an eject button. If you find yourself connecting the same devices frequently, you may want to consider making them mount automatically. For example, I have an external 250GB hard drive that is always at my desk. 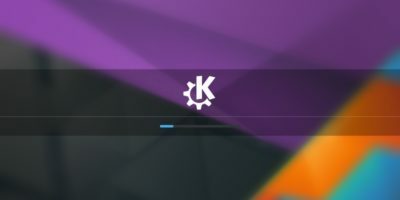 When I login to KDE, I want it mounted already. “General” options tell the widget to display removable, non-removable, or all devices. 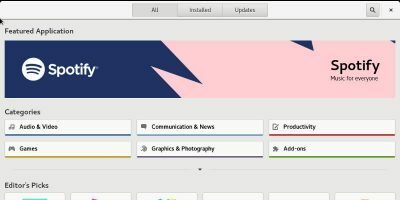 “Device Actions” is where you can add, edit, or delete actions associated with media and device types. 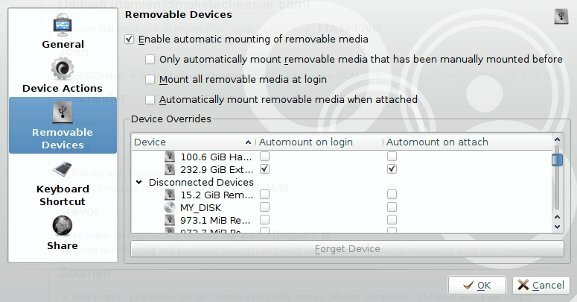 In order to configure automatic mounting, click on “Removable Devices”. At the top are general options that will apply to all devices. In order to automatically mount any devices, check the first box to enable auto-mounting. The sub-settings underneath it are optional but may be useful, depending on your situation. In the box below those settings, you will see “Device Overrides“. This section allows you to setup automatic mounting for specific devices, such as my external hard drive. 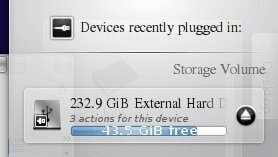 In the first tree, it will show currently attached devices, including internal drives and their partitions. Find your device, and check “Automount on login”, “Automount on attach”, or both options. In the second tree, you will see “Disconnected Devices”. Device Notifier will remember all of the devices you have ever connected. Using this, you can configure devices you might not have at the moment, but it also can be a security risk if you do not want a device to be listed. To remove one, select it and then click the “Forget Device” button at the bottom. When you are finished configuring, click “OK”. KDE’s device management system is designed to provide ease of use while still offering flexibility and a variety of options. With it, you should rarely, if ever, need to drop to the command line to manage a removable device. There's one problem with this widget. It just can unmount devices (I mean, in this case, my external hard drive), but it can't to turn it off, so it's still unsafe to disconnect device. 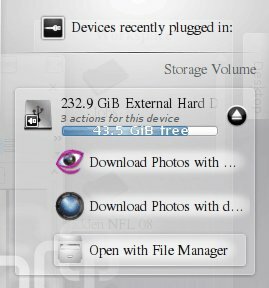 For this reason, I have additionally to use Gnome Disk Utility. It's good that this application doesn't have much Gnome dependencies, so my KDE is quite “clean”. It is a common misunderstanding caused by windows also temporary shutting down the usb port. However, when you unmount a drive it first syncs (write everything still in the IO buffers) the disk, and then removes the filesystem. The leds om (all) my external disks then flash for about one and a half seconds after unmounting. This is the time the disk itself takes to write anything that was still in the (disk) buffer. After that, you can safely remove the disk. So, don't jank out the drive right after clicking unmount, but wait for the disk to stop flashing. And, any not ancient disk will park the heads (by a simple mechanism) after removing the power. Hi Tavis, i use a AAO with a encrypted sd card acting like mi home filesystem, how can i make to hide this card or make it unmountabled?